Most have heard stories of how beer came to be and know some of the history, but few have gone this deep into the details. A Natural History Of Beer takes an intimate look at that beverage we all love. There are tons of books on the topic of beer and how it came to be. They mostly tell the same story, with some a bit more detailed than others and a little differentiation between histories. A Natural History Of Beer dispenses with the stories we’ve all heard and gets into a level not normally seen in beer books. The authors here come from a scientific background, and it shows. A Natural History Of Beer looks at beer element by element. They start higher-level and then really get into the science of things. It starts with history, people, and beer. Innovation, industry, and more. Various cultures and their relationship with beer are explored. Not the simple stories you hear on a brewery tour, but much more detailed looks at various groups throughout history and the role beer played. Then it’s on to science. Things start heavy and stay that way. Exploration of molecules and factors involved in brewing are followed by chapters devoted to water, barley, yeast, and hops. We get into scientific formulas and things not covered even in advanced homebrew books. It’s certainly more than most expect to find in a beer book. Part three gets into our relationship with beer. We’re talking a detailed look at the mechanisms that allow us to smell and taste it, along with the effects it has on our body. Science is the focus here again, and chemical interactions with the brain, blood, tongue, stomach, and more are examined closely. It ends with the phylogeny of beer, recreation of historical brews, and what the future may hold. A Natural History Of Beer is an interesting read, but be warned that it’s more than the typical beer lover may be looking for. The science involved may be better suited to a more advanced home brewer, though it may be more than they’re looking for too. If you want to learn the basic history of your favorite beverage, I’d look elsewhere first. If you want to really get into what beer is made of, how it interacts with our bodies and our world, this is a great read. 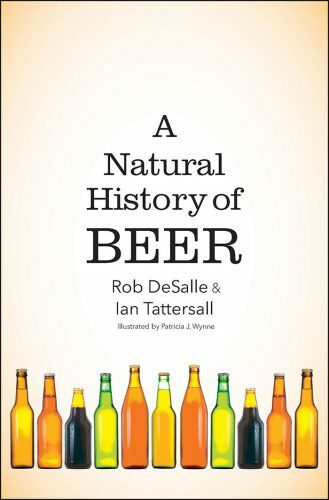 Grab a copy of A Natural History Of Beer from Amazon now and bring your beer knowledge to a new level.